Select the map of the County where you will be fishing. This will show all watersheds within the county; we recommend printing the County map. Identify the watershed of interest; stream watersheds will have blue labels and have blue, dotted outlines; we recommend printing the map of the watershed of interest. Examine the watershed map and identify the stream reach that you are interested in fishing. Pay particular attention to road crossings as these may be the only readily accessible public access points to many streams. Select the stream reaches you want to fish and print out their maps. Easement stream reaches are numbered from the headwaters, with number 1 being the furthest upstream, and the highest numbered reach being closest to the stream confluence with the next stream. When you have printed your maps, you may choose to laminate them in plastic. The final product can be 3-hole-punched for storage in a 3-ring binder. Cost for the printing is $2 per map, plus $1 for the lamination. The NTC easement map package includes a copy of the DNR easement brochure, and instructions for use of the maps. 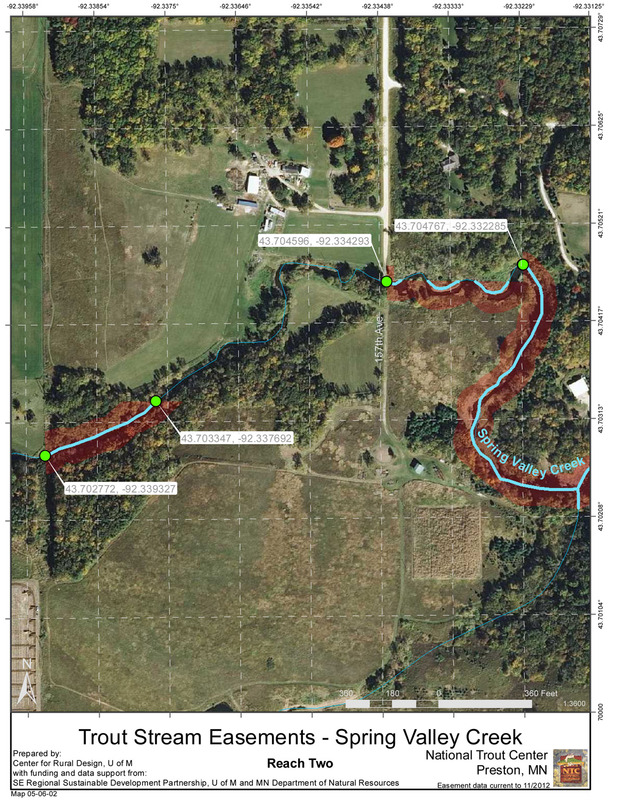 The map below is an example of how a stream easement map will look on a letter-sized page (8 1/2″ X 11″). Staff at the National Trout Center can assist you in putting together a set of maps that will help you to plan your fishing trip to SE Minnesota streams.